This tower of a gift is a sight to behold, with its stunning floral artwork and gorgeous pink ribbon. But, as Mom likes to say, it's what's inside that counts - and there's plenty here to prove her point. Our experts have made crunchy milk chocolate Moose Munch® Premium Popcorn, dreamy dark chocolate and ruby cacao truffles, delectable dark chocolate-covered graham crackers, and irresistible milk chocolate covered blueberries. 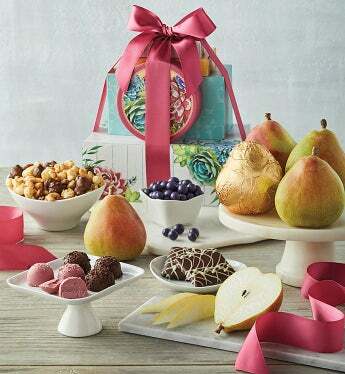 Last but not least, we've hand-packed five succulent pears, one of them wrapped in gold foil. Because Mom deserves nothing but the finest.